Description: Four Seasons Maui Resort Design – The Serenity Pool at the Four Seasons Maui was designed to serve as a quiet alternative to the main pool area and the beach at the resort. The designated site for this pool was a long narrow hillside that offered a spectacular ocean view. The final design took full advantage of the view by orienting the end of a long rectangular pool toward the ocean with a sweeping infinity edge. One side of the rectangular pool offers water lounging alcoves between lush tropical plantings. 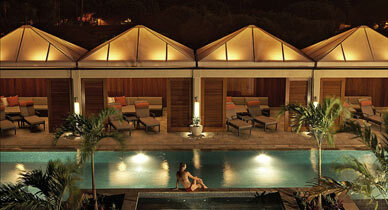 The other side of the pool is lined with oversized cabanas with luxuriously detailed teak interiors. A swim-up pool bar with underwater seating allows users to enjoy cocktails in the pool while taking in the view.